Amid the hustle and bustle of the holiday season, Swiss-­trained master confectioner Christophe Bonzon has been quietly creating a new lineup of merry sweets in his “workshop”, Chez Christophe Chocolaterie and Patisserie in Burnaby Heights. 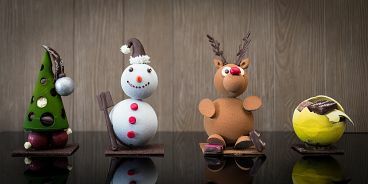 The festive collection includes three limited edition Bûches de Noël (Yule Logs), an array of handmade chocolate sculptures, and winter truffles. From a snowman, adorable reindeer to the classic Christmas tree revisited by Bonzon and ornaments, the 2014 holiday chocolate sculptures, all handcrafted with Swiss chocolate Carma, are sure to enchant both children and adults alike when put on a mantle or stocking. The artistic, edible designs range from $29.95 to $59.95 and are filled with Chez Christophe bonbons inside. Chez Christophe’s special Christmas truffles include three varieties: pumpkin, Christmas spice and blackberry, and cannelle noisette (cinnamon hazelnut). Holiday box sets are also available. Bonzon, a native of Switzerland, trained under some of Europe’s best grand masters at Zurich’s Chocolate Academy and at L’Ecole du Grand Chocolat Valrhona in France. Previous to opening his own patisserie in 2013, he was executive pastry chef at Vancouver’s CinCin Restorante and Choux Cafe in Western Australia. He recently won two gold medals at the 2013 and 2014 International Chocolate Awards for Canada.